Late-blooming double tulips are also known as peony tulips because of the shape of their flower head, resembling of fluffy peonies. Peony tulips have large and double flowers that can reach 10 cm across. The heavy flower head can be easily damaged by wing and spring shower. 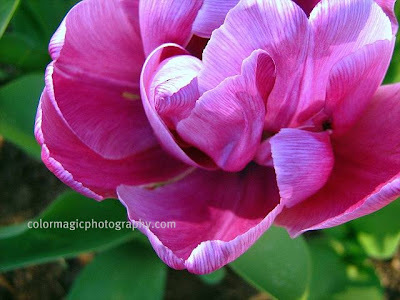 This here is a long lasting double late tulip, in a lovely purple color. How to capture reflections in raindrops? Click on the picture to read this easy tutorial on How to capture reflections in water drops/raindrops, in macro photography? 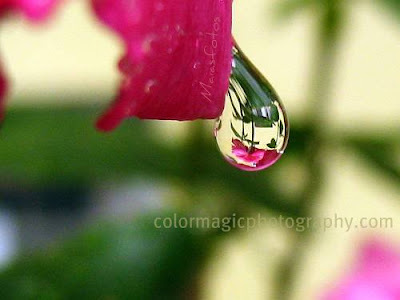 © 2010-2019 Macro Flower Pictures : Images or any text may not be copied and/or reproduced without the owner's written permission.